Like a caterpillar becomes a butterfly, a small start-up can become a high revenue turning business. Locate a Locum has become such a butterfly. A finely tuned and well-oiled butterfly at that! 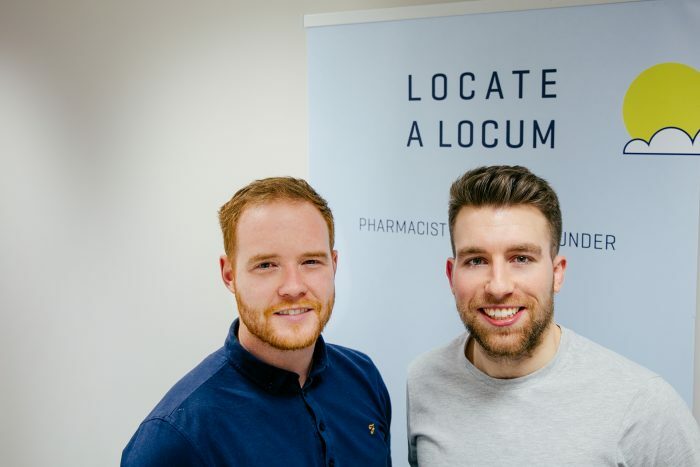 Three years ago, local pharmacist, Jonny Clarke, build a basic website that made life significantly easier for locum pharmacists and pharmacy owners alike, when it came to sourcing and filling temporary shifts. Now, we’re a business with over a dozen members of staff, including co-founder Michael Budden who is spear heading the technical development of our software product, catering to both locums and pharmacy owners alike. We spent over a year in the Ulster Bank-funded E-Spark location in Lombard House, where we availed of some of Northern Ireland’s finest business mentoring from Lynsey Cunningham and John Ferris. We’ve now graduated to the Gas Works, beside Deloitte and other local technology hotshots. Moving on came at the opportune time. It coincided with the launch of our new mobile app. The app allows pharmacists to source and apply for temporary work within 50 miles of their location. We have 2,400 active app users with a further 2,000 that we’re transitioning away from our traditional desktop site. An industry that was once averse to technological change, has embraced a platform that solves the traditional human resourcing headaches. We’ve certainly disrupted the pharmacy recruitment market throughout the UK. Traditional agencies are struggling to keep pace with our rapid, digital hiring methods and low costs for pharmacy owners. Our technology allows for online identity and documentation checks that can greatly reduce time for hiring managers. Our next move will be into the pharmacy recruitment sector in the Republic of Ireland. It will require a further investment in staff, something that we have spent a year preparing ourselves for, having proven our model and worth within 8,000 UK pharmacies. After that, Europe? The United States? We’re aiming high, but we aren’t rushing. We’ve learned to plan ahead while remaining adaptable and learning from our customers and our mistakes. For all you budding entrepreneurs out there, building a scalable business isn’t about gaining large volumes of customers at speed. Rather, it is being able to build a solution that works at the heart of your client’s needs, and being able to offer the same levels of service to your oldest customer, as your most recent. If you're a pharmacist who wants more locum shifts, check out our bookings platform. If you're a pharmacy owner, get in touch to see if you're eligible for a free trial of our new software!